Manure runoff in the Karnopp family's yard in Kewaunee County. Many Kewaunee County residents have wells that are contaminated. Tuesday they will hear from a scientist who has been studying their drinking water. WUWM's Environmental Reporter Susan Bence reports. Kewaunee County, 100 miles north of Milwaukee, has become the poster child of unfortunate distinction: an alarming number of its private wells are contaminated. On Tuesday, residents will hear from a scientist who has been studying the county's drinking water. So, how are the wells becoming contaminated? In recent years, more mega dairy operations called CAFOs (confined animal feeding operations) have swallowed up Kewaunee County's fragile fields. Two years ago, U.S. Department of Agriculture microbiologist reported that both bovine manure and human waste contributed to the county's contaminated water issues. A section of Kewaunee County's CAFOs on a foggy day. Now, after deploying new analysis, microbiologist Mark Borchardt found that farming and animal manure pose far greater risks than other factors. While some Kewaunee County residents say they look forward to Borchardt's report, many have been insisting for years that their private wells have been contaminated because manure is making its way into the groundwater. A number of Kewaunee County residents shared their concerns about contaminated well water at the March 12 land & water conservation committee meeting. Nancy Utesch and her husband are grass-fed beef farmers in Kewaunee County. "We have gathered for well over 15 years with some of the best scientists, some of the best data. We are not confused about what's happening here. 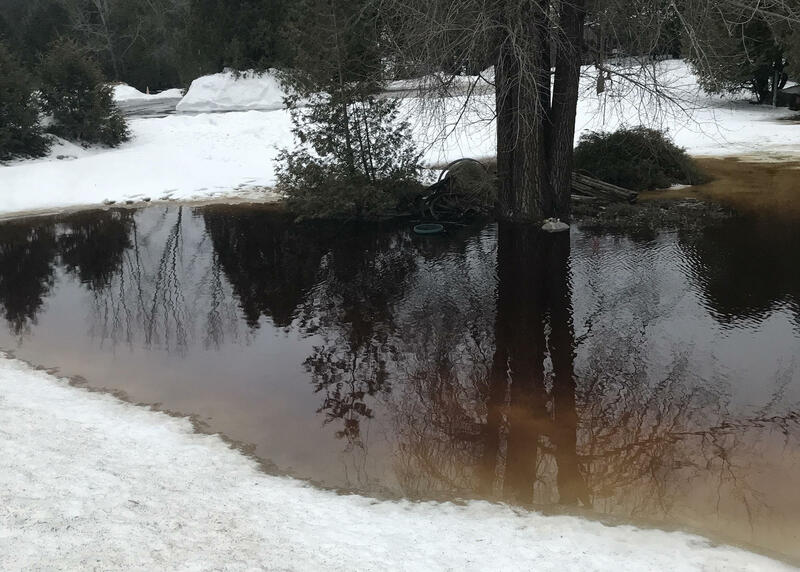 There is absolutely a lack of initiative in addressing this problem; there’s a lack of political will," Utesch said at a recent meeting of the Kewaunee County Land & Water Conservation Committee. Jodi Parins' echoes Utesch's frustration. "Hundreds of thousands of gallons of manure water [has been] leaching into the ground and eventually into our drinking water. I want to know what aggressive steps you are going to take to make it up to the residents," she says. Arlin Karnopp lives close to a CAFO: "My parents ran the farm and the land was sold and since then our well is contaminated, so those pictures tell everything," Karnopp says. The manure pond in Arlin Karnopp's yard. At the meeting, Karnopp was passing around photos taken earlier that morning outside the his family home. The yard was blanketed in still frozen manure. "When it melts now, like Thursday, it's going to end up in the East Twin River," Karnopp says. The East Twin River, in fact all of Kewaunee, Door, Manitowoc and parts of two more counties, are part of one massive watershed. The East Twin River. Arlin Karnopp says he's not only worried about his contaminated well but the impact of manure on the region's watershed. Karnopp's wife, Mary Lou, worries about their children and grandchildren. "I'm having a new grandchild in summer and I have to keep my daughter-in-law away from our water. This is not how we should be living. We've lost the value in the house and everyone says it's not their fault. I want it to stop," Mary Lou Karnopp says. There were CAFO farmers in the room, but nobody spoke out. In earlier interviews, CAFO farmers have said they face stiffer environmental rules than smaller farmers, and they follow those rules. CAFO critics have affected some change in dairy management. Last year, Wisconsin revised its manure spreading rules for places like Kewaunee that have fragile topography — little top soil with fractured bedrock, called karst, below. Davina Bonness, Kewaunee County's land & water conservation director addressing the committee. The new rule puts some limits on where and how farmers can spread manure. In particular, farmers cannot spread during the winter when fields are frozen. During the Kewaunee County meeting, Land and Water Conservation Director Davina Bonness reported to the committee, pointing out one potentially problematic nuance of the law. She says manure spreading season is coming soon, no matter the weather conditions. "Yes, April 16, according to law people can spread no matter is on the ground," Bonness says. These Kewaunee County residents hope the new scientific findings that will be outlined Tuesday will result in stiffer farming regulations. Northeast Wisconsin's Kewaunee County is home to 16 large dairy operations. On those CAFOs, or concentrated animal feeding operations, are tens of thousands of cows, who produce lots of manure. Neighbors have become increasingly worried that, that manure is contaminating nearby wells. Though the county hugs Lake Michigan, it’s what is underground that makes the area particularly vulnerable to manure ending up where you don't want it – in the water people drink. Sixteen large dairy operations pepper Kewaunee’s county landscape – so do the fields on which they spread their manure. Today, more than 30% of Kewaunee County residents’ wells are contaminated. The geology of the county allows manure to seep into the groundwater, and the situation finally resulted in action. Resident Lynn Utesch served on workgroups, along with representatives from agencies, such as the EPA and state DNR.